The Department for Education has been sharing details of school children's nationality and place of birth with the Home Office. Campaigners, including parents and teachers, today called for a national boycott of the school census for the second year in a row. Last year the census began asking for every child’s nationality and place of birth, leading to concerns information gathered would be used for immigration enforcement purposes. These fears were confirmed in December, when freedom of information requests revealed the Department for Education had agreed to share the personal details of up to 1,500 schoolchildren a month with the Home Office – with the intention of “creating a hostile environment” in schools for illegal migrants. Parents do not have to complete the nationality and place of birth part of the census, which 8 million people have been asked to fill out, and it does not affect schools’ funding, so campaign group Against Borders for Children have urged parents to leave those parts blank. 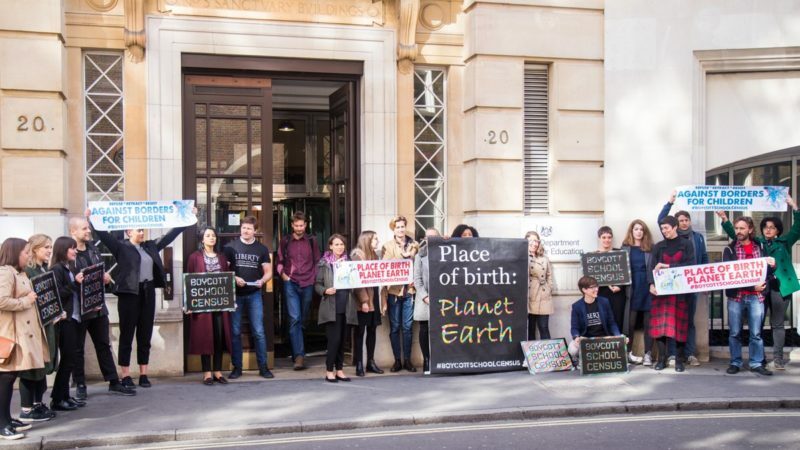 Today, protesters gathered outside the Department for Education in London and many people wrote that their child’s place of birth was ‘planet earth’. Parents also took to Twitter to share photographs of their children opposing the census. Home Office asking for our place of birth? “Every child has the right to go to school and feel safe. “The damaging impact when trusted services like schools share data with the Home Office cannot be understated. Children will be withdrawn from school and denied an education because of the climate of fear the Home Office is intentionally creating. “There is overwhelming opposition from parents, teachers, and children themselves to the idea of bringing border controls into the classroom. The Department for Education confirmed to Sky News that information about “illegal migrants” was obtained from the National Pupil Database and used to contact families to “regularise their stay or remove them”. A spokesperson said information including a child’s address and school details would be requested when the Home Office had “clear evidence of illegal activity or fear of harm”. They said information about nationality would not be shared with the Home Office. The category, included in an original information sharing agreement, was removed after pressure from more than 20 organisations last year.